Today’s post is our fifth look at robo-advisors and ready-made portfolios. Today we’re going to look at IG, AJ Bell, rPlan and Scalable Capital. In our four previous articles we looked at 12 UK offerings (though admittedly three of these were from NutMeg). Ready-made portfolios from existing platforms and asset managers who want to head off the threat of customers defecting to robo-advisors. The problem with the second group is that they are too expensive for a passive service – they all charge more than 1% pa. The problem with the first group is that their portfolios are generally unsophisticated, to the point of MunnyPot simply dumping your cash into a single Vanguard LifeStrategy fund. And they aren’t really cheap enough, unless you invest £500K. I’ve summarised our findings to date on this page, which has a live link to the table shown above. So the hunt for a cheap (< 0.5% pa), simple and well-diversified product continues. And today we have four new candidates. IG Group is best known for its spread betting product (which I use and like), but recently they diversified into stock broking. They charge £8 a trade, so I’ve stuck with i-Web and DeGiro (£5 and £2 respectively). Now they have come up with Smart Portfolios. 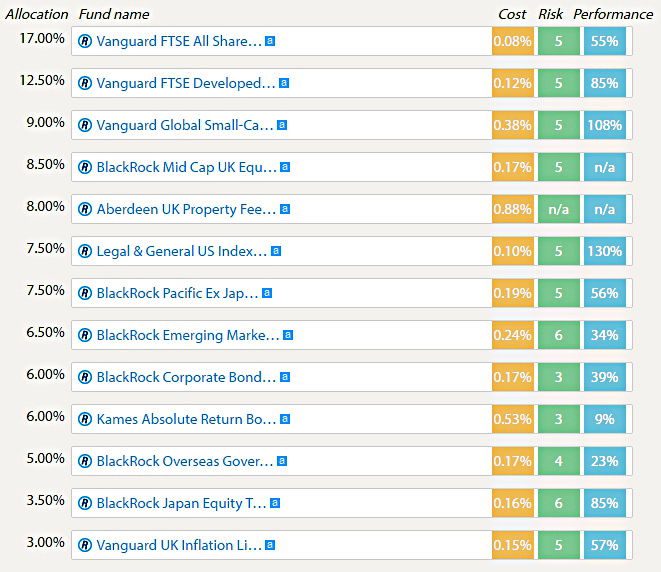 There are five portfolios (risk levels), each built from BlackRock ETFs. They are called Cautious, Moderate, Balanced, Growth and Aggressive. 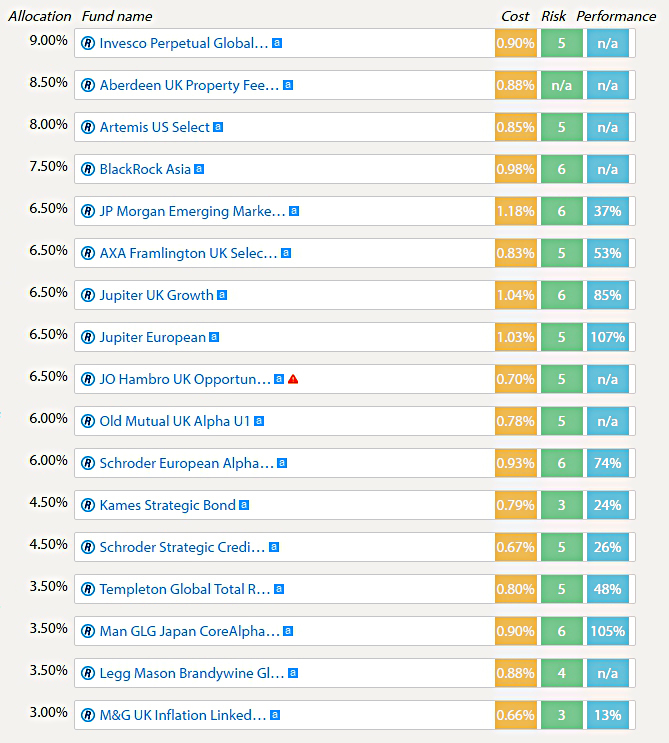 They are each actively managed according to BlackRock’s asset allocation models. You can have an ISA or a SIPP, as well as a regular taxable account. Before you can open an account, you need to answer a few questions about your financial situation and your investing experience. This doesn’t apply to existing customers of IG. There’s also a rudimentary risk tolerance questionnaire, which feeds into which portfolio you are offered. The marketing page doesn’t tell you much beyond this, so I had to try the service for myself. I had hoped that this was a fixed fee, so that the more you invest, the less significant it would become. At £100K it’s £9.62 a week (£500 pa) or 0.5%. Growth is 0.27%, as is Aggressive. So the total fees range between 0.92% (£50K, Aggressive) and 0.48% (£500K, Cautious). Hiking the platform fee with the amount invested is a real shame. And if the fee was fixed at £325 pa it would be the market leader. But with the rising fee, it’s just the same as the others. In fact, it’s more expensive than Nutmeg for all portfolio sizes. AJ Bell (of YouInvest fame) have introduced their own range of Passive Funds. Cautious, Moderately Cautious, Balanced, Moderately Adventurous and Adventurous. They are all globally diversified across Shares, Bonds, Property and Cash. They all cost 0.5% pa, and there’s no custody charge until January 2019. These are cheap for large portfolios (eg. This is 0.25% at £50K, £100K and £250K. At £500K it drops to 0.175%. There’s also a dealing charge for funds, at £1.50 per trade. So the overall charges range from 0.75% down to 0.68%. This is the cheapest offer from an established platform, but not cheap enough to tempt me. rPlan appear to offer ISA and taxable accounts, but no SIPP. The marketing page pitches the “bank-level security” of their product and the fact that they are FCA regulated. Other than that it doesn’t tell you much, apart from the biggest selling point – the price. That’s got me interested, but surely there’s a catch. Indeed there is – the 0.35% includes the underlying CoFunds platform charge, but not the fund charges themselves. So really, 0.35% is the platform charge, and the fancy website is just a front-end for CoFunds. So rPlan’s mark-up starts at 0.06% and rises to 0.10%. 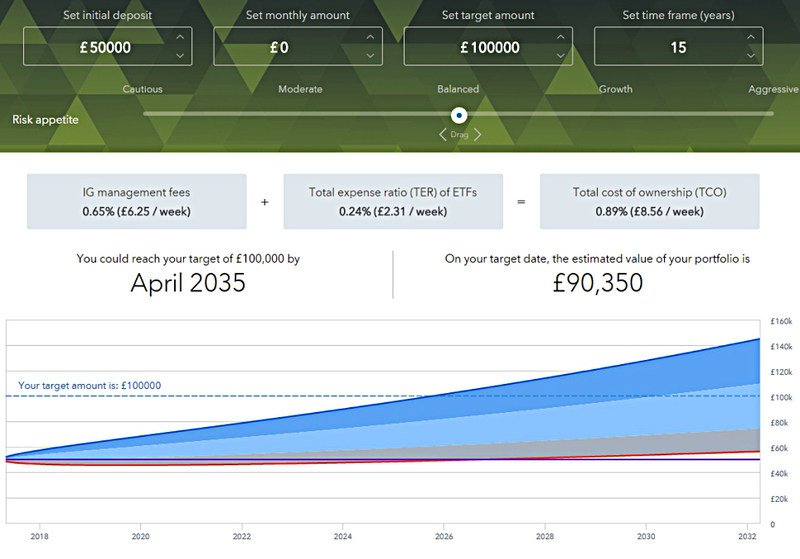 The funds on the rPlan platform vary wildly, from tracker fundings starting at 0.06% pa up to active fund charging a staggering 3.93% pa.
To get the total cost of your portfolio down to 0.5%, you would have to stick with the cheapest trackers. The portfolios are actively managed (the asset allocation and choice of funds changes) and each portfolio comes in two flavours – Active (funds) and Hybrid (mostly passive funds). When you look at the makeup of the funds, the (much cheaper) Hybrid option is chosen by default. As an example, the Higher Risk portfolio looks like it costs around 0.27% pa for the funds, so 0.62% pa in total. This is broadly comparable with putting together your own DIY indexed portfolio. The active version of this portfolio is a lot more expensive, at around 0.90% pa for the funds, or 1.25% pa overall. This is another disappointing robo-advisor, which is really just a web front-end onto an existing platform. Cheaper and better is quite the claim. Let’s see. They offer an ISA, and a taxable account, with a SIPP “coming soon”. 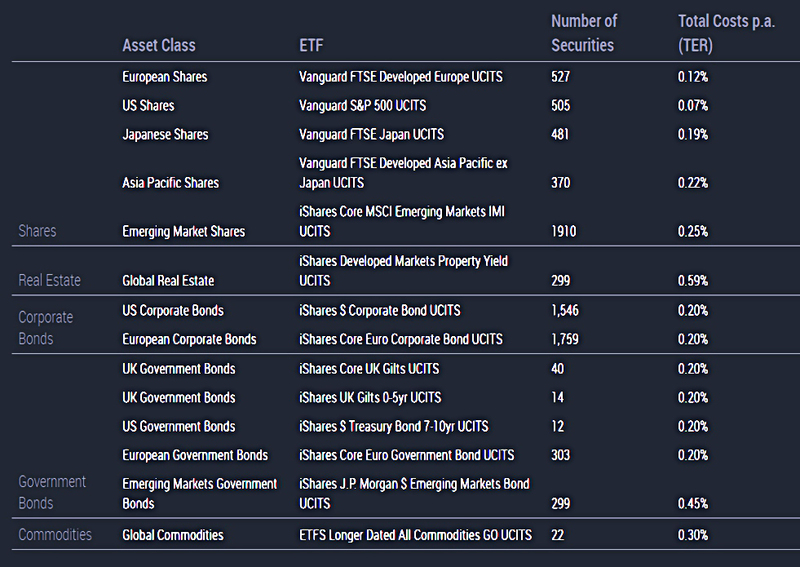 They use ETFs with charges ranging from 0.07% to 0.50% (0.25% on average). Portfolios are made up of the usual stocks, bonds, property and cash, but this time with commodities added in too. As of 30th March 2017 they had €200M of assets under management. Their USP seems to be risk management and monitoring. One of the co-founders is a professor who developed this technology. It’s not immediately clear in what sense the portfolios are “personalised”, as there seems to be just one product on offer. It turns out that you answer a risk questionnaire to determine what level of Value at Risk (VaR) you are comfortable with. 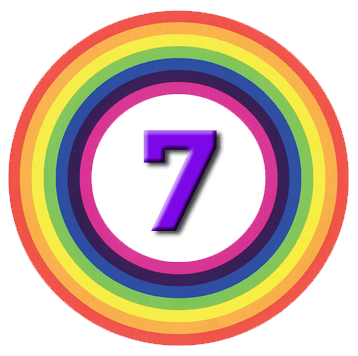 VaR is calculated at the 95% probability level, so a 12% VaR portfolio should lose more than 12% only once in 20 years. The marketing part of the website doesn’t translate levels of VaR into underlying asset allocations. There’s a lot to like about Scalable Capital, but as usual the fees are the problem. SC charge 0.75% pa, and with average ETF charges of 0.25% pa, the total charge is 1% pa.
With just 14 ETFs in their portfolios, I could do it myself for less, particularly at higher portfolio values. It’s been a frustrating day. At some point, each of IG, rPlan and Scalable Capital looked as though they might be what we were looking for, but each time the devil was in the detail. The AJ Bell portfolios were more straightforward, but still too expensive. You can also find a live version on the RoboAdvice master page, or by following the link in the footer of this page. I’ll be back in due course with more reviews of advisors, still looking for the holy grail of cheap and good.